Every home we design is a fully customized project. There is no one-size-fits-all. "Green homes incorporate environmental considerations and resource efficiency into every step of the building and development process to minimize environmental impact. The design, construction, and operation of a home must focus on energy and water efficiency, resource efficient building design and materials, indoor environmental quality, and must take the home's overall impact on the environment into account. However, many of the processes and technologies that go into a green home happen behind the scenes and behind the walls. What can a homebuyer look for? "Look for an NAHB Research Center Certified certificate, the homeowner's guarantee that the home was built according to one of the levels of green outlined in the NAHB Model Green Home Building Guidelines. The NAHB Research Center is the sole certifier recognized by NAHB’s National Green Building Program. Many of the energy-efficient qualities of a green home are easy to spot. Appliances, windows, and water heating systems will likely have ENERGY STAR ratings. The home should also include efficient lighting fixtures and bulbs. Renewable energy sources, such as photovoltaic electricity and water heating systems, further decrease the overall energy consumption within the home. Fixtures and appliances such as low-flow showerheads, faucets, and toilets, and ENERGY STAR dishwashers and washing machines all conserve water. Programmed, low-volume irrigation systems, rainwater collection systems, wastewater treatment systems, and hot water recirculation systems also save water. Check out this great graphic of how much water our homes are wasting, and you'll appreciate why we go "low-flo'! These decisions—from home size, to orientation on the lot, to floor plan layout—are made in the design of your home and development of the lot. The house orientation and design should take advantage of natural daylight to reduce lighting needs, and should use strategies to reduce heat gain in the summer and heat loss in the winter. The home should contain renewable materials, including rapidly-renewable wood species such as bamboo, and recycled-content materials in carpets, tiles, and concrete formulations (fly ash). The heating, air conditioning and ventilation system (HVAC) must be appropriately sized for an efficient and properly ventilated home. 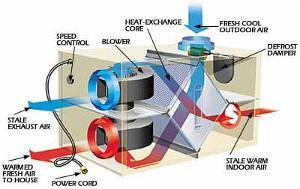 Fans in the kitchen and bathrooms should cycle fresh air inside, and release stale air. Consider a heat recovery ventilator due to our very tight construction. Low/No-VOC paints and finishes, and low-formaldehyde building materials (cabinets & sheathing) should be used as well. "Wonderful" you say, "but what will it cost me and what can I expect from the investment?"